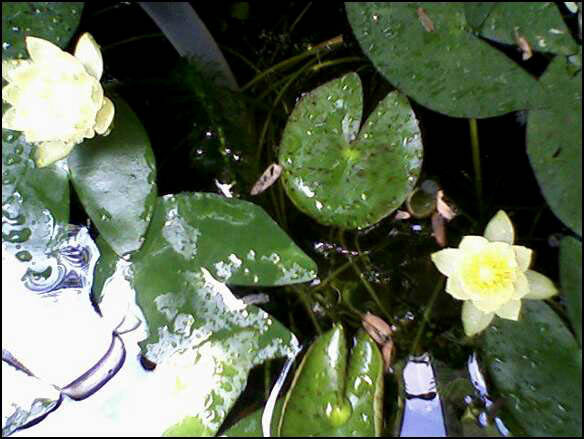 The Helvola water lilly (miniature) has bloomed in the small tub. This plant has come back every year since 1991! Hard to believe but the plant even survived after being dragged out onto the hot sidewalk by a bird ( might have been a 4 legged varmit too). It winters inside and is very resistant to problems. Both water gardens are aerated with small electric pumps and tubing that creates mini-fountains. This is a natural way to keep mosquitos at bay. Nothing is better than picking your salad a few minutes before preparing and eating it. Here is a sample of some of what I got out of the box last week. 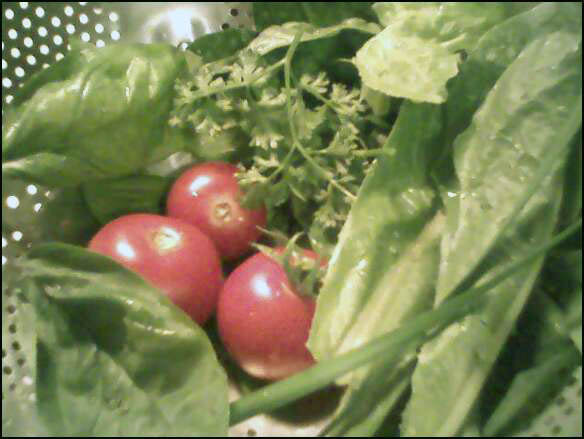 (July 4th tomatoes, parsley, lettuce, big leaf basil garlic chives and chives).